Here is a photo of a partially stitched picture which when completed, will hang in my newly renovated bathroom. 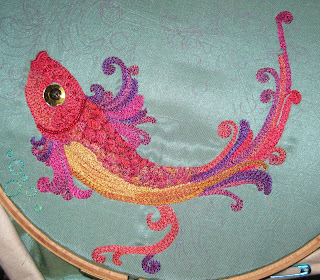 It is a circular design with another fish curved above this one. I took it from an image I found on the net. Watch this space for the completed work! I have stitched for many, many years since I was 6 years old & I am now nearly 75! It's my passion - always has been. Many thanks for the interest you show in my work. What a charming piece! The colors are so cheerful! I really like this piece. Nice job! I specialize in silk hand-embroidery. I am trying to bring Imperial Silk Hand-Embroidery to Chicago. Therefore, I need some starting help for my fundraising project.